As the official sponsor of birthdays, the American Cancer Society and the Nebraska Department of Health & Human Services (DHHS), Tobacco Free Nebraska program encourage smokers to quit on November 18th – the Great American Smokeout. Tobacco users that quit take an important step towards a healthier life – one that leads to reduced cancer risk and more birthdays. For those ready to quit, they can call the free and confidential Nebraska Tobacco Quitline at 1-800-784-8669 (1-800-QUIT-NOW), or visit QuitNow.ne.gov, for tobacco cessation and coaching services that help increase their chances of quitting for good. DHHS and the American Cancer Society are working together to help people quit tobacco and strive towards a healthier lifestyle. The American Cancer Society held its first Great American Smokeout in 1976 as a way to inspire and encourage smokers to quit for a day. One million people quit smoking on that first day and the numbers have increased ever since. 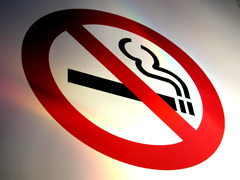 o Tobacco use is the single largest preventable cause of disease and premature death in the U.S.
o Cigarette smoking accounts for about 443,000 premature deaths – including 49,400 nonsmokers. o Thirty percent of cancer deaths, including 87% of lung cancer deaths, can be attributed to tobacco. o In Nebraska, smoking accounts for over one billion dollars annually in smoking-related medical costs and lost productivity.